This hugely authentic ‘factional’ memoir of Jack reads with the authenticity of an autobiography. The book begins at a time when children were seen but not heard, when fathers said little and internalised their feelings – and mothers managed everything from scarce resources to the thoughts of their children. 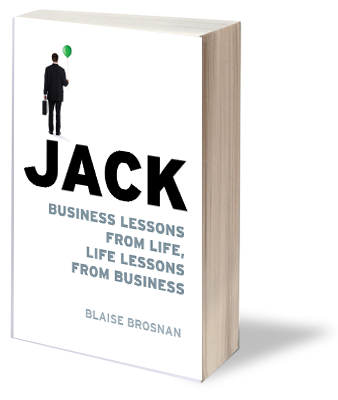 Blaise Brosnan, business mentor and trainer, uses the life story of Jack – his influencers and his influences – to give concrete advice that will benefit anyone working their way from the ground up. He sees into Jack’s mind and reflects his thoughts, revealing how he coped with life’s problems. Jack pays a price. But does it merit the prize? In the book we follow Jack as he grows up and the many influences, good and bad, that he experiences. The chapters that occur in the boarding school and on the building sites of London are vividly drawn and unerringly credible. From there, Jack comes back to Dublin and he eventually finds his own feet. He learns life’s lessons the hard way but steadily and cleverly he starts to rise in the world. He, in turn, influences others. Guides and critics help and hinder Jack as he tries to negotiate his way to his own version of success. Everyone in Ireland knows Jack. Perhaps he is a colleague, an adviser or a friend. Perhaps he is you!